Flu season is all around us. Every time that we hear a cough or sneeze, we shudder just a little inwardly and hold our breath in hopes of avoiding any potential flu germs. But even with covering our mouths and washing our hands, sometimes these germs still find a way in. It’s in these instances that it is more important than ever to fight those germs from the inside out. Take a look at how seeing a chiropractor and getting regular care may help strengthen your body’s ability to fight off the flu and keep you feeling healthy all season long. When you first think of a chiropractor, you probably imagine someone popping your back to eliminate pain in that area. While this is definitely one of the goals of chiropractic care, it’s a lot deeper than what it appears on the surface. Chiropractors focus on the spine. They search for problem areas known as subluxations, which are misalignments of the vertebrae of the spine. Once found, chiropractors will use spinal manipulation to put them back into their proper location. So while it seems that they’re just “popping” your back, the actual mechanics are much more complex. What is the Connection Between the Immune System and the Spine? 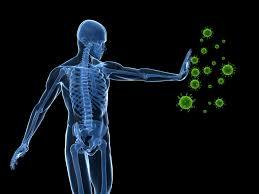 Even after you understand exactly what chiropractors do, it can still be confusing as to how this affects the immune system. But this is not as complex as it seems. The spine is a part of the body’s communication system, also known as the central nervous system. This part of the body takes messages from the brain, and sends them to the other systems in the body (such as the immune system) to ensure proper and efficient function. When the spine is unhealthy, it causes a chain reaction of bad consequences. It can cause the CNS to be unhealthy, which causes the communication to be misconstrued, which then causes inefficient function of the body systems. And when the immune system isn’t working, it means that germs (such as the flu!) can slip between the cracks and make you ill.